It seems that we are harking back to the austere 1940s with the attitude of make do and mend...or are we? It is now fashionable to have nostalgic items of furniture or patterned wall paper adorning our houses, slightly faded, re-painted in shades of cream and grey; dubbed shabby chic I too have succumbed to it's pretty veneer. 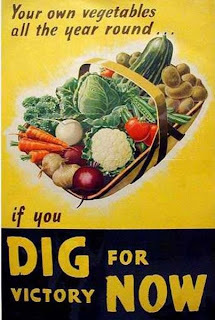 But maybe we should really start to listen to the older generation of the war years and not simply take something fashionable from it, starting with food and our eating habits. Britain was never healthier than the decade of the 1940s when the entire country was mobilised to Dig For Victory! Growing our own fruit and veg is lighter on the pocket and most likely a big improvement on the tasteless mass produce found in the supermarkets. This brings me nicely on to the TV programmes based around British food culture and tradition such as The Great British Bake Off with Mary Berry and Paul Hollywood. Now into its third series it seems more popular than ever and has inspired me to try my hand at baking sometime in the near future. For now though there is the bread machine and I am loving trying different types of bread mixes. It's not really cheating, is it? ;-) I loved watching the Easter Masterclass that Mary and Paul presented together, a great mixture of appetising food and good humour! In keeping with the Great British theme is the Great British Sewing Bee. Now textiles was a pet hate of mine during secondary school, the sewing machine hated me and since then I've stuck to the highstreet for my clothes. Yet I've grown more disillusioned with what the shops have to offer, namely cheap and disposable items that cannot withstand the wear and tear of daily use. Charity shops are the number one place to go, especially in the more upmarket towns such as Blackheath. So what if the items are slightly more expensive than your average charity store, these are quality pieces and some even sport designer labels for all you fashion followers! Keep an eye out for a bargain and you'll have vintage clothing at cut price that will last! 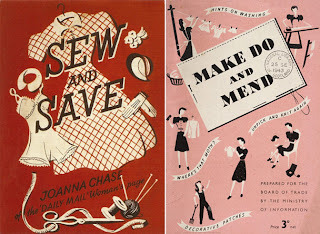 Definitely making do, and if you are handy with a sewing machine you can make and mend your own and stand out in unique items that are tailored just for you! Another of my favourite shows to tune into is Kirstie's Handmade Britain and Kirstie's Home for Christmas. Kirstie turns her hand to all sorts of makes and bakes in these programmes and gives helpful design tips for interior decor as well as making one off, special gifts for birthdays and Christmas. Perfect! More on my training, writing and kitties soon!